The first time I saw my guest Scott Chaskey, he was on top of a farm tractor, his sun-reddened face tucked into a vast expanse of white beard that flowed down his chest. I had an impression of generous geniality — one that has subsequently been borne out over the years that I have come to know him. But that day, it made me feel welcome on my first day of harvesting my weekly share of vegetables, herbs and flowers from Quail Hill Farm in Amagansett, New York. Chaskey is the director of the farm, a CSA — for community-supported agriculture. 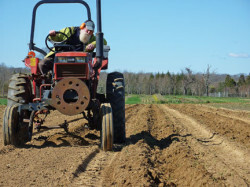 He’s also a past president of the Northeast Organic Farming Association of New York. And he’s a poet. But his new book, Seedtime, while filled with his poetic sensibility for language, is an impassioned defense of humanity’s age-old relationship with seeds. It’s also a warning of the grave threats to our food supply posed by industrial agriculture and environmental degradation. The diversity of our seed supply is being lost at a time when we need it more than ever. 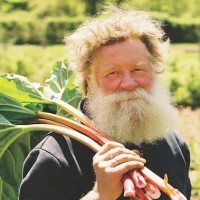 Scott Chaskey is a revered figure on the East End of Long Island — a key player in shaping the region’s awareness of sustainable food and farming. For a quarter century, as director of the Peconic Land Trust’s farm at Quail Hill, he’s promoted a whole systems approach to agriculture — an approach, he says, that practices cooperation with all living things, not exploitation of them. In Seedtime, he prompts us to consider what seeds mean to us, to hear the ancient tales they tell, and to imagine new stories about them. Scott Chaskey is a poet, farmer and educator on the East End of Long Island. In addition to Seedtime, he’s the author of This Common Ground: Seasons on an Organic Farm. Also on today’s show: Amy Dryansky reads her poem “Grass Whistle.” Listen to our interview with Amy Dryansky. How come you always send your notices After The Fact? This one is 5 days after! It would be nice to hear what writers are saying!